Objective: To examine temporal trends in the burden of eating disorder (ED) features, as estimated by the composite of their prevalence and impact upon quality of life (QoL) over a period of 10 years. 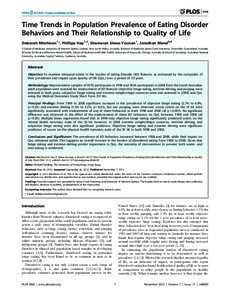 Methodology: Representative samples of 3010 participants in 1998 and 3034 participants in 2008 from the South Australian adult population were assessed for endorsement of ED features (objective binge eating, extreme dieting, and purging were assessed in both years; subjective binge eating and extreme weight/shape concerns were also assessed in 2008) and QoL using the Medical Outcomes Study Short Form (SF-36). Principal Findings: From 1998 to 2008 significant increases in the prevalence of objective binge eating (2.7% to 4.9%, p,0.01) and extreme dieting (1.5% to 3.3%, p,0.01), but not purging, were observed. Lower scores on the SF-36 were significantly associated with endorsement of any of these behaviors in both 1998 and 2008 (all p,0.001). No significant difference was observed in the effect of the endorsement of these ED behaviors on QoL between 1998 and 2008 (all p.0.05). Multiple linear regressions found that in 1998 only objective binge eating significantly predicted scores on the mental health summary scale of the SF-36; however, in 2008 extreme weight/shape concerns, extreme dieting, and subjective binge eating were also significant predictors. Objective binge eating and extreme dieting were significant predictors of scores on the physical health summary scale of the SF-36 in both 1998 and 2008. Conclusions and Significance: The prevalence of ED behaviors increased between 1998 and 2008, while their impact on QoL remained stable. This suggests an overall increase in the burden of disordered eating from 1998 to 2008. Given that binge eating and extreme dieting predict impairment in QoL, the necessity of interventions to prevent both under- and over-eating is reinforced.